The day was an exquisite treat: to be outside, so close to the water, laughing with friends. Now there are buds and blossoms strewn across tree branches. The air is warm. I wore shorts and a tee shirt, and left the house with wet hair that dried “wild,” as the Frenchman likes to call it. And it made me so happy, in the fresh aftermath of winter, to bike past blooming trees, bare yesterday, but today covered in tiny pastel flowers. When the sun started to set, we wandered to the grills and the Frenchman lit a big fire. The Frenchmen, collectively, grilled: sausages, steak, and chicken, which we nestled into pretzel rolls and dressed with caramelized onions and mustard. Everyone brought a little something; everyone shared. 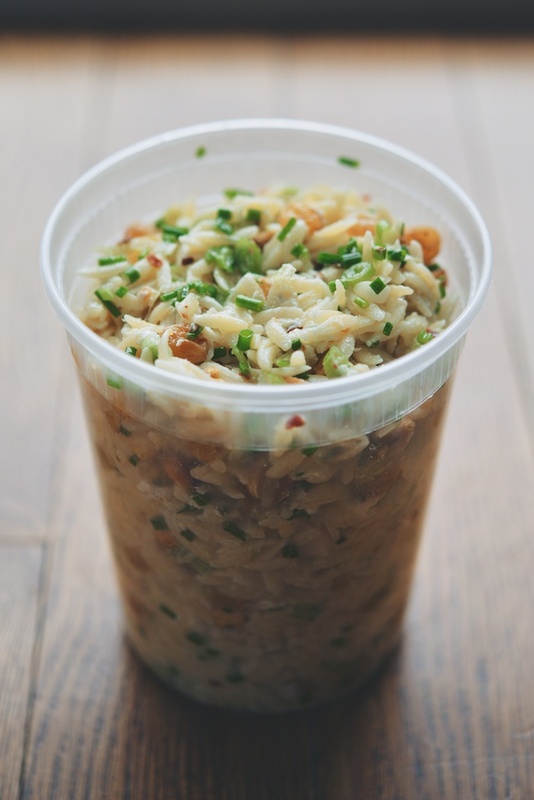 I opened a container of this orzo salad. Someone made sure there was plenty of wine, and then chocolate chip cookies. When the sun disappeared completely, we stood around the dimming fire. Across the dark and shivering river, golden checks of light flicked on and illuminated a collage of skyscrapers. The day was picture perfect, and so necessary. It reminded me of the pleasure that waits on the far side of winter. 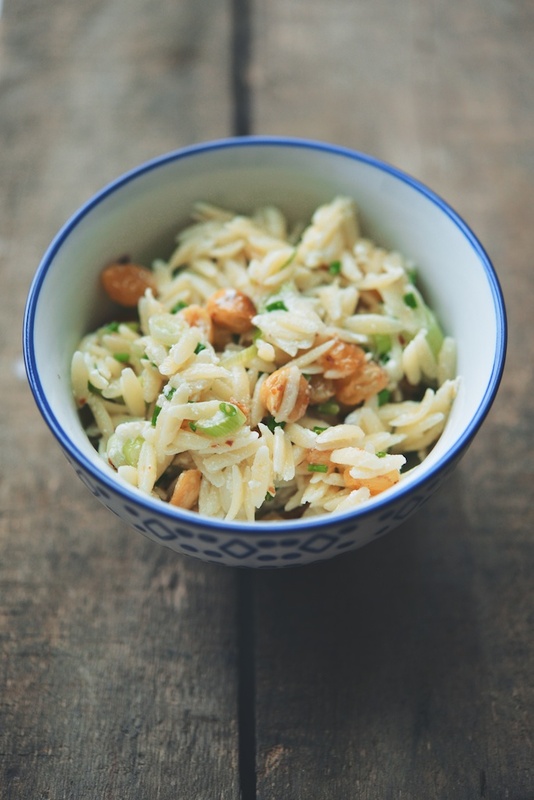 This salad is my version of an orzo side dish I recently saw (and bought and devoured) at Brooklyn Larder. It marries famously with nearly any preparation of chicken, or with grilled lamb, sausages, or steak. Serve it for Easter. I have also taken it to the office, to eat straight from the container. This recipe will transition into spring and early summer. I will top it with fat asparagus and grilled lemon, when at last they appear at the market. Last week, I stirred in chopped and blistered shishito peppers, to replace the red pepper flakes, and loved the green heat they brought. It is also a make ahead affair, perfect for travel, potlucks, and picnics. (Because of the goat cheese, it should not really remain un-refrigerated for too long, but I have never had an issue.) The dressing may be made, the raisins plumped, and the hazelnuts toasted the night before. In fact, the whole salad can be made several hours, or even a day or two ahead. I am offering the recipe in grams, for those who crave precision, but this is a loose kind of thing, really. If you do not like hazelnuts, or would prefer not to bother with the oven, try pine nuts, walnuts, peanuts, or Marcona almonds instead. Increase the quantity of whichever element you particularly enjoy. This is also one of those recipes where there is inactive time in which to get started on the next step of the procedure. I have categorized the recipe into individual tasks, but I recommend reading all the way through before you get started. Makes 1 quart pasta salad. Serves 4-6. The dressing makes 3/4 cup. Good in the refrigerator for up to 2 days. Serve chilled or at room temperature. Heat the oven to 350F (176C). Scatter the hazelnuts across a baking sheet; bake the nuts for 10 minutes. Out of the oven, allow them to cool and then remove the skins. You may leave the nuts whole, or roughly chop them. Set the hazelnuts aside. Meanwhile, bring the red wine vinegar plus 1/2 cup of water to a healthy simmer on the range. Add the raisins, and then turn the heat down to low. 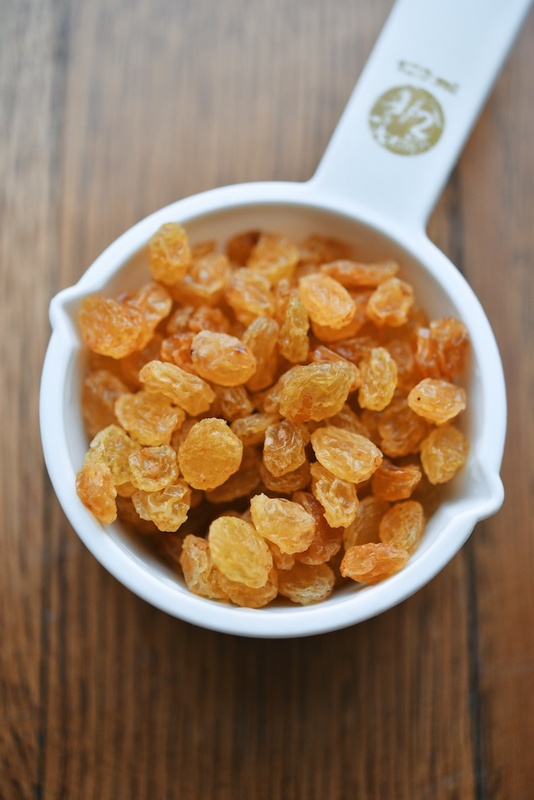 Cover the pot or saucepan, and cook the raisins for 10 minutes. Then, turn off the heat, and allow the raisins to sit in the vinegar solution for an additional 20 minutes. Drain the raisins and set them aside. 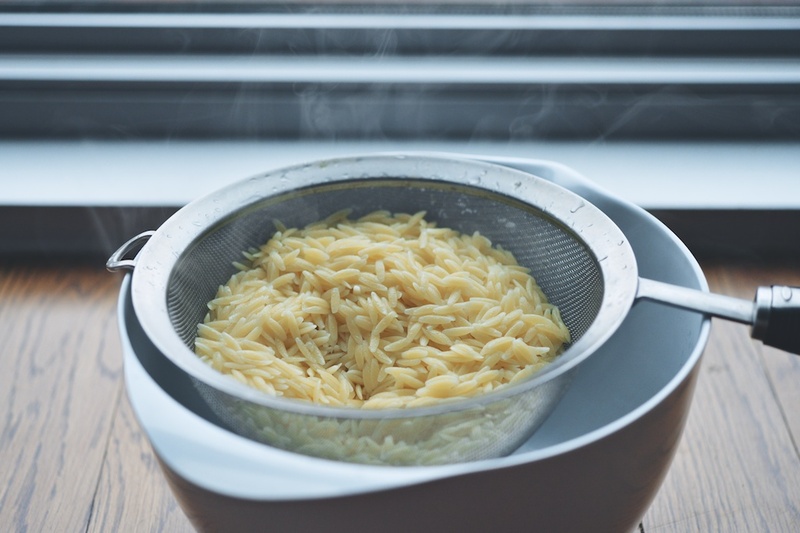 Bring a pot of water to a rolling boil; add enough kosher salt to make the water taste like the sea. 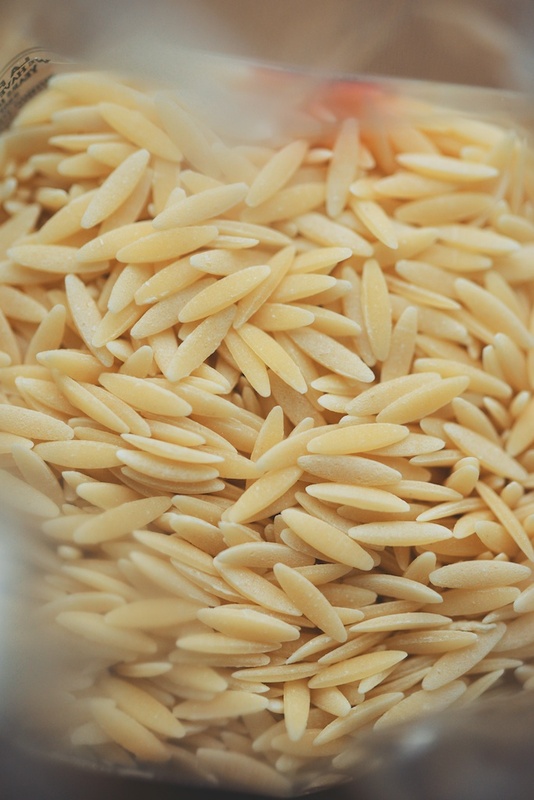 Add the orzo to the pot, and cook until al dente. (For me, this was consistently 2 minutes less than the bag recommended.) 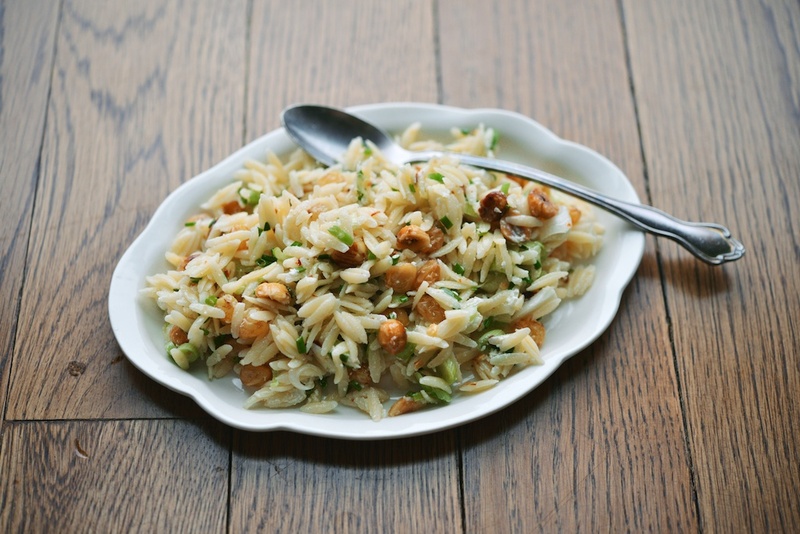 Drain the orzo, and stir in a bit of olive oil, just so that the pasta does not stick. 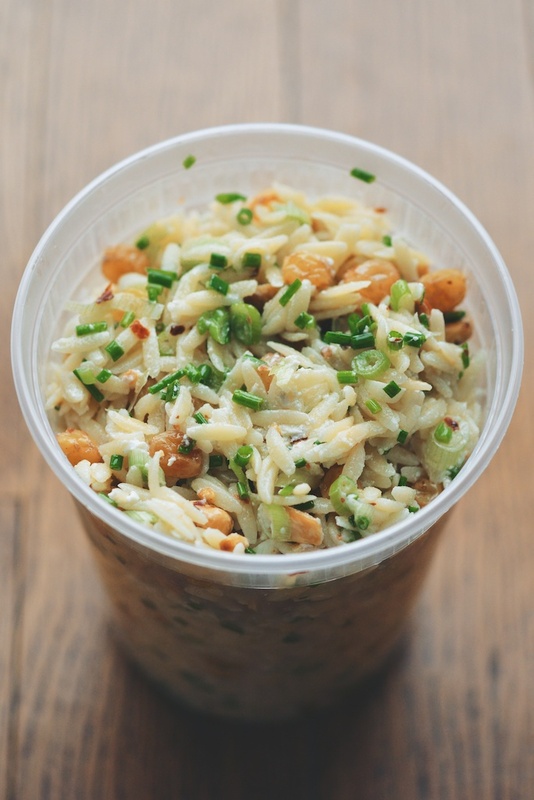 Allow the orzo to cool for 20-30 minutes. Make the dressing: add the lime juice, the rice wine vinegar, and the champagne vinegar to a small bowl. Whisk in a little pinch of kosher salt. Add the sesame oil and the 2 tablespoons olive oil. Whisk the dressing to emulsify, and then set it aside. 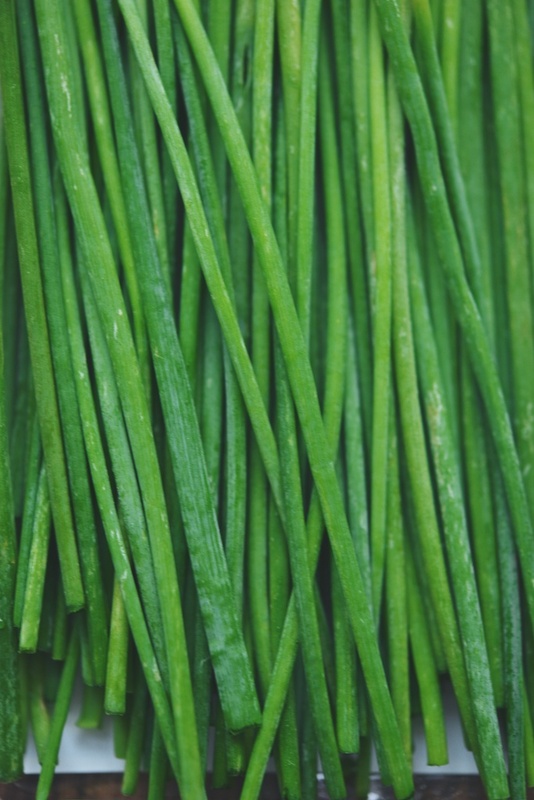 Clean and then thinly slice the whites and light greens of the scallions. Mince the chives. 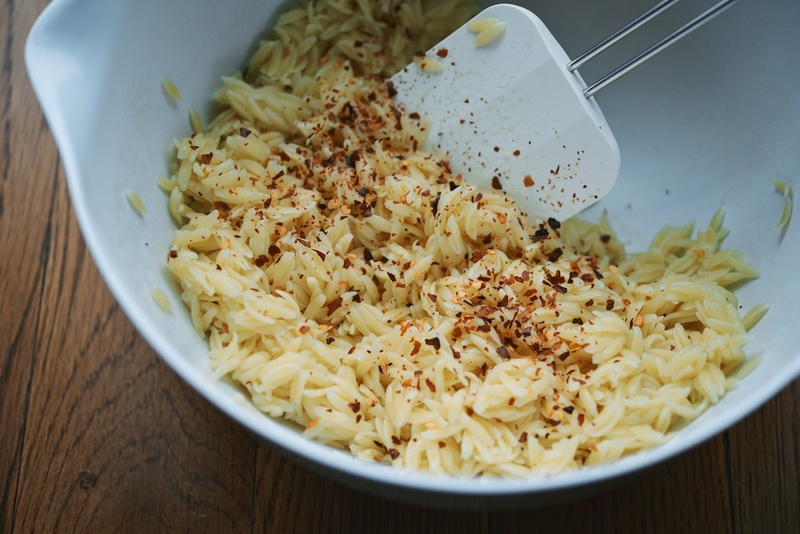 In a large bowl, stir the red pepper flakes into the orzo. Add the hazelnuts, the raisins, the scallions, and the chives. Fold in the dressing. (If you are eating the salad fresh, I think 1/2 cup of dressing is sufficient. I usually save the remaining 1/4 cup for just before serving, especially if I make the salad ahead of time. But add the dressing bit by bit, and taste according to your preferences.) Stir in the sea salt. Using a fork, break up and crumble the goat cheese into the bowl, and lightly fold it into the salad. I can’t wait to make it again, but this time double the recipe. Thanks for sharing. 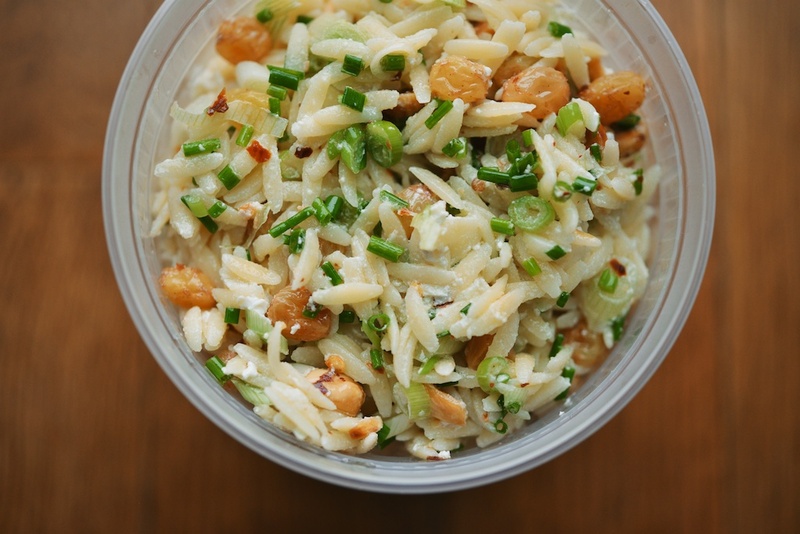 Orzo salad is one of my favorites, especially with chickpeas. 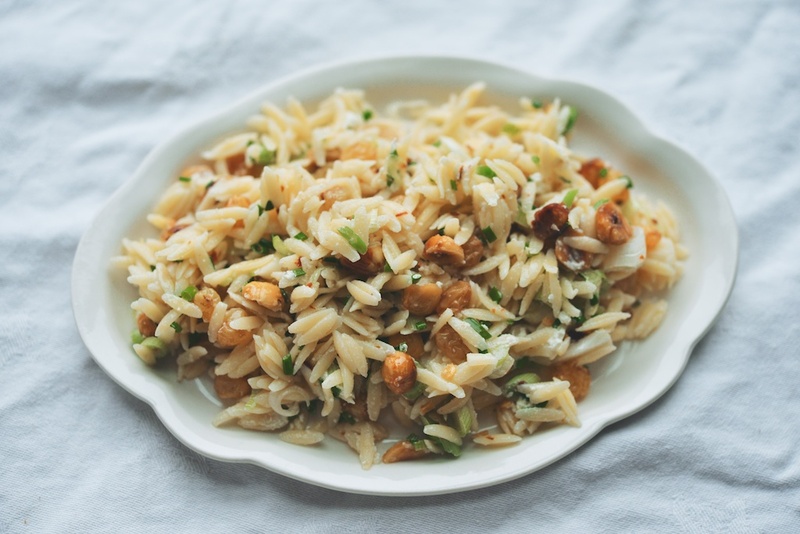 I toast the orzo in a dry skillet before boiling – it gets addictive. I bet this was a lovely day out! 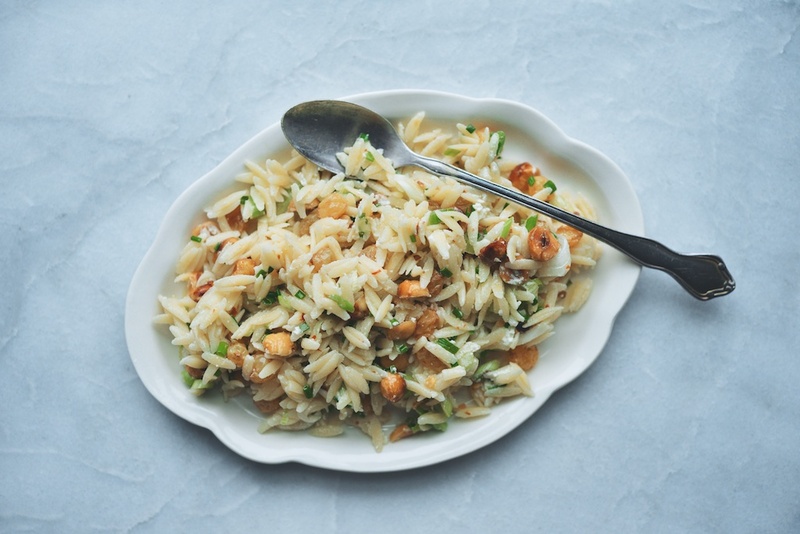 I had not thought to toast the orzo first; I will have to try that!